It's Christmas in July at Mystery Playground and we're making a Sherlock ornament filled tree this summer at the excellent suggestion of Pattie Tierney. We do this in the summer so you have plenty of time to plan your own Sherlock tree before the holidays really get rolling. You can see our Mind Palace ornaments, the Illustration Cut Out ornaments, and the Silhouette Cube ornaments from earlier in the month. 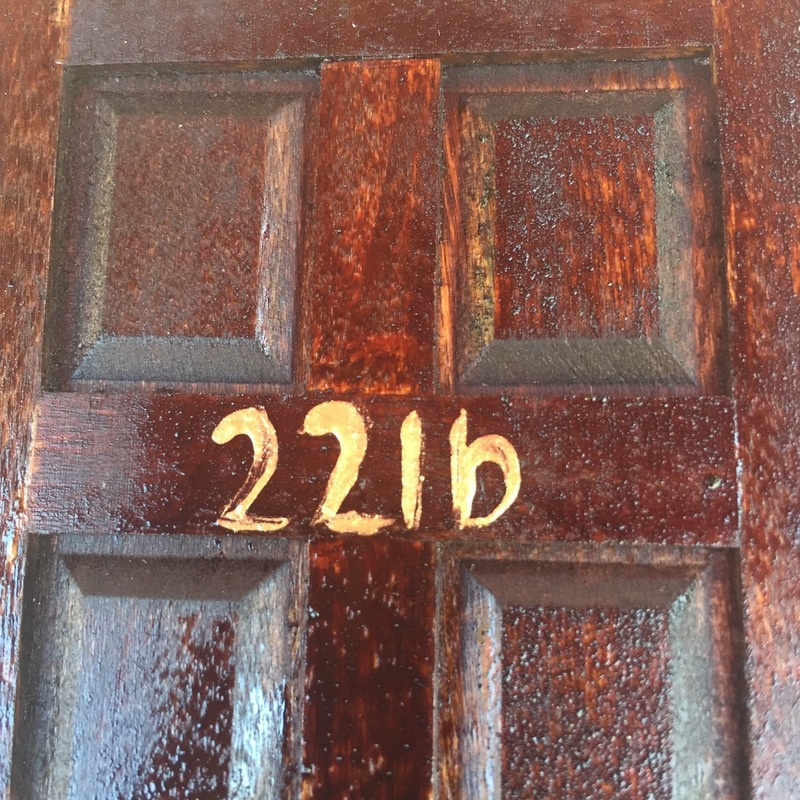 Today we're making a 221b Door Ornament. I've seen these all over Pinterest, so I can't say it's my original idea, but it's so many places there isn't one place to tip the hat. They are so cute, I couldn't leave them out of this series. Turns out they are pretty easy to make. 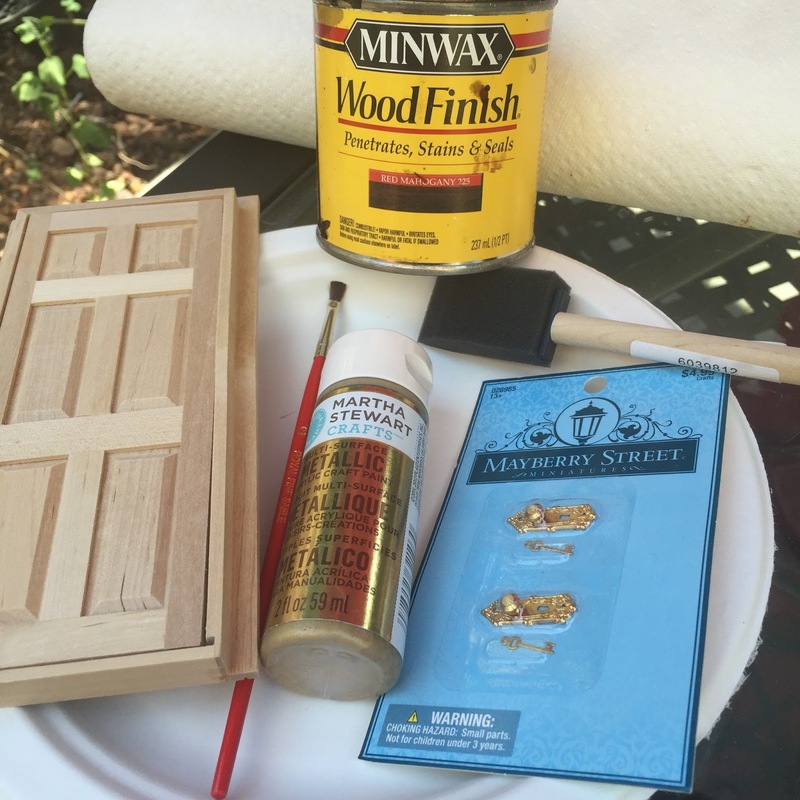 Paint your dollhouse door. I used wood stain because I had it around. You want to paint all sides and it may take more than one coat to get it just right. Use a damp paper towel to quickly clean away any drips or excess. 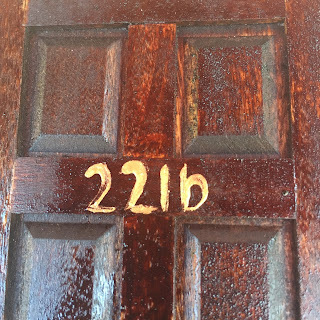 After your door has dried, now is the tricky part - painting on the 221b. Now, there are commercially make little numbers for dollhouse doors, but you'll need two sets and you'll still have to paint the b anyway. I decided just to wing it and paint all of the letters. It isn't perfect, but it's good enough for most Sherlock trees. I practiced on my paper plate with the gold paint and discovered that the BBQ skewer allowed be to be a little more precise than the paint brush. You may want to try both on the paper plate and see which you like best. Let dry. Glue your little door knob onto your little door. Use just enough Gorilla Glue so it doesn't drip down the sides or through the little key hole. Let the door knob dry. Now you are ready to make a hanger. Cut the ribbon to three inches long. 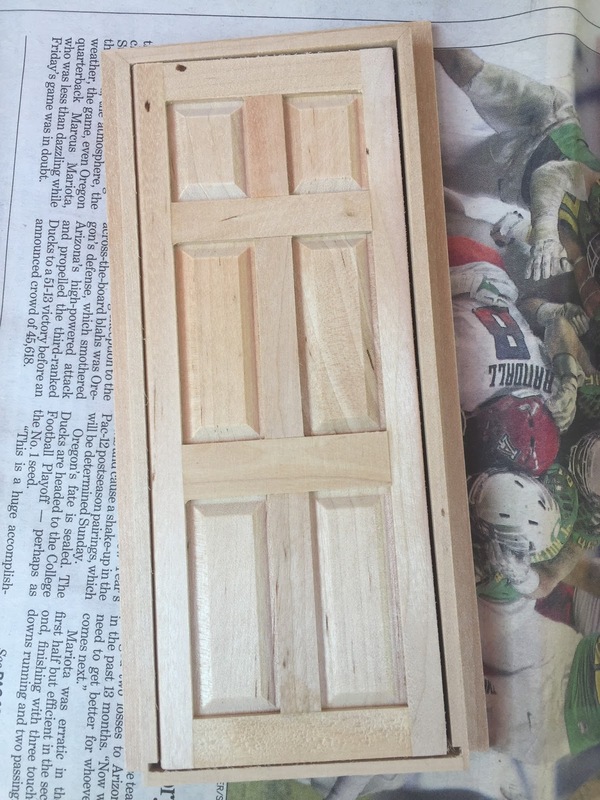 Make a loop and use the Elmer's glue to adhere the ends to the top of the door. Let dry. Since the door opens, you can take a photo of your favorite Sherlock and glue the outsides of the photo to the frame. And now you are done. We'll be back in a few months to show you the entire tree and make suggestions for Sherlock ornaments that you can put on the tree with these four beauties.